A few years ago I did a fair number of Via Ferratas in the Dolomites and around Lake Garda, and since we changed our 2018 trip from a cycling trip to a hiking trip, I thought I’d do a few Via Ferratas in France. From what I see, there’s a big difference between the VF’s in France and those in Italy. The Dolomites has so many VF’s, and it’s assumed you know what to do and can take care of yourself. In France, the VF’s tend to be associated with a town or village, and the town will often charge a small fee to do the VF. And you can’t guarantee the VF will be open. Of the few VF’s I did in France, the best one (Peille) was closed and in another (Tende), the best section was closed. French bureaucracy being what it is, there is no estimate on when the Peille VF will open. The Tende VF has two issues in the best, Grottes des Hérétiques, section. The cables, which met the required standards when they were installed but standards have now changed. In Italy they wouldn’t care, but in France everything has to shut down – and it’s been shut for over a year now. The other issue is that the landing platform for one of the tyroleans is damaged. There are plenty of locals who would be happy to fix it for free, but no, it must be fixed by an authorized and accredited company. And so the Grottes des Hérétiques section is closed. The authorities hope to have it open in 2019 Sigh. There are several web sites that provide information about the various VF’s in France and I list them below in the Links and Other Clicks section. In the meantime here is a bit of info you might find useful. We visited Andorra for a few days and I did a few via ferratas there. The country relies heavily on tourism for its money so does a good job of providing information about the via ferratas. They have information on their web site – see link below. They also have a good phone app that shows the location of the via ferrata and the access and return paths, and uses GPS to show your location on the map. The app also has information about hiking trails and is well worth downloading. You can also pick up a little booklet called “mountain” from the Tourist Offices, which has basic info about the via ferratas. The via ferratas tend to have a lot more horizontal movement than I’d like, with chains for the hands and rock for the feet. The cables are thinner than those in France, and the cable anchors further apart. Additionally, many of the reaches to the rungs were at arms reach for me, and there were even some reaches where I had to dyno for the next rung. All in all a different experience to the via ferratas I did in France. Not bad, just different. I’d never done a Tyrolean traverse in the Dolomites so these were a new experience for me. They exist sometimes to link different rocks, and sometimes just to add a bit of excitement for visitors and tourists who want to try a via ferrata. You need a pulley and the most common one is the Tandem Cable Pulley made by Petzl. In the Maritime-Alps you are required to have the yellow pulley which is slower than the silver “Speed” pulley. I don’t know about other parts of France. The Tyrolean has two cables: one for the pulley, from which you are hanging; and one for your lanyards for safety. All your weight should be on the pulley cable, otherwise a) you will be slowed down, and b) you may wear a groove in your aluminum lanyard carabiner. Since your weight will be pulling down the pulley cable, you need to make sure the lanyards have enough length that they are not pulling on the safety cable. With modern stretchy lanyards it’s worth having a sling to ensure there is enough length. On my first tyrolean I had far too much weight on the safety cable with the result that I had to pull myself across the whole tyrolean, which was exhausting. Worse, I wore a groove in my lanyard carabiner. So I replaced the lanyard carabiner and bought what I should have had in the first place, a steel carabiner for clipping the safety cable. 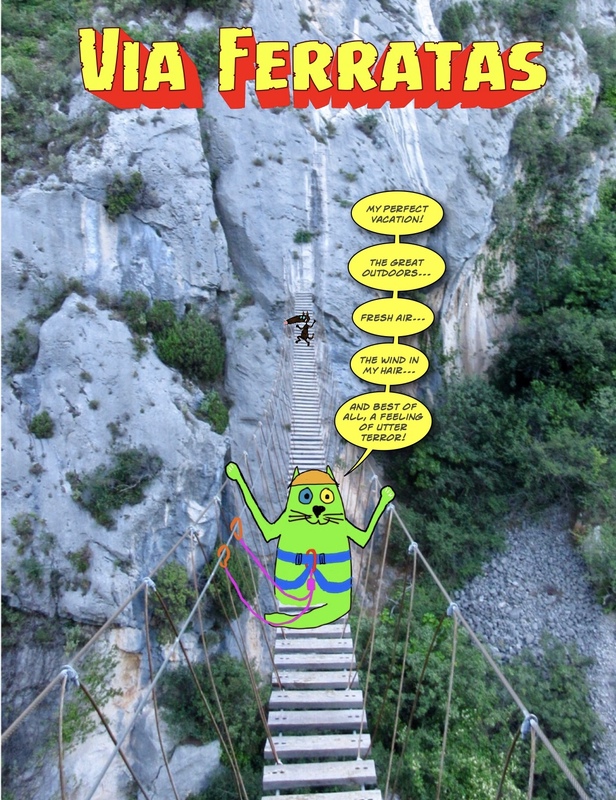 Update: I did the via ferrata in Florac, in the Gorges du Tarn area. The tyrolean there is almost horizontal and they suggest the “Speed” pulley. Also, the tyrolean does not have a safety cable so there is no issue with lanyard carabiners 😀😢😃. The Yellow Tandem Cable Pulley from Petzl. laviaferrata.net is my favorite site for information about VF’s in France. One of the features I like is that you can sort the detailed list of VF’s in any way you like. If you don’t understand French, Google Translate does a good job of translating the descriptions. viaferrata-fr.net is another good site. viaferrata.org has many of the pages in English. However not all VF’s have an English page and you may need to switch to French. A page about the via ferratas in Andorra. A page where you can download the Active Tourism app for Andorra.